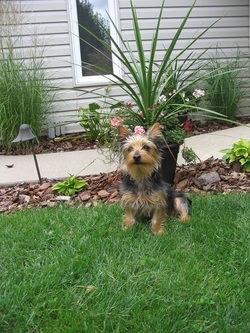 If you are looking for a Silky Terrier look no further. We had visited many websites and weren't happy on how commercial they all seemed. When we found Cory and Terri-anne we didn't look any further. We had make arrangements to come see the puppies and were very please to see how loving they were towards their dogs. There were 2 females and 1 male and we were wanting a male. We have a Silky already and had just lost our Miniature Schnauzer of 16 years and needed a companion for Tito (our Silky) As we told our story I didn't realize that Cory and Terri-anne were making sure that they felt we were suitable for the puppy, they weren't just letting them go to just anyone. We passed! They had asked us if we had a name picked out because they would start to call him by his name so he would know it when we got him. They also kept us updated with pictures and would let us know how he was doing. When it was time to pick him up they suggested that since we lived in Hamilton they would be more than happy to meet us somewhere. Terri-anne had made up a bag for us with a nice note, a ball, a toy, a blanket and a pouch of food. Well it has been 8 months that we have had Tanner and have never once been disappointed. Right from the first day when he arrived in our home he has been a joy. He got along with Tito right from the moment they met and loves everyone, he was well socialized. He is healthy and very very smart, in one afternoon he learnt how to use the poochie bells (ask Cory & Terri-anne about them). I can't say enough how happy we are with Tanner and Corey and Terri-anne feel like family, they are very helpful if you have questions and love to have updates and pics of the dogs. Maggie and Mia were two very fortunate puppies. They are from the same litter and went to the same loving home. "My parents surprised me and my sister with our first dog during Christmas over 20 years ago--it was a Silky Toy Terrier named Misty. After 15 years of the best moments of my family's life with this dog, we decided that after she passed on, we would adopt yet another Silky Toy Terrier named Mila. Both dogs changed all of our lives. The unconditional love (and forgiving nature) these dogs gave us penetrated the core of our hearts. emails, so that I would not miss out on their first few months. On the day of getting the girls, Cory and Terri-Anne met me half way (almost 2 hours from their home) to deliver the girls. I will never forget that day! I saw two cute puppies in Terri-Anne's arms (the girls were dressed in nice sweaters). My life changed yet again that day. As I write this entry, I have Maggie at my feet and Maya by my side. Both watch over me...and I watch over them. I don't have children yet, but consider them "my girls". I am thankful that Cory and Terri-Anne check in every once in awhile to see how we are all doing--and that means a lot to me." We could not be happier with our puppy, Maizee. When we decided to get a second dog, we also decided that we would only buy from a reputable breeder. We were very lucky to find Cory and Terri-Anne. They took the time to answer all of our questions and provided us with just what we wanted: a lovely, healthy, affectionate and very well-socialized little puppy. Maizee loves everybody and has to say ‘hello’ to everyone she meets. I cannot begin to count the number of people who have stopped me to ask why kind of dog she is and comment on how adorable she is. Everyone she meets falls in love with her. She is also a very smart little pup. She was already going to bathroom outside by the second day we had her home! After Maizee had her first grooming, our groomer, who has been in the business for over 30 years, was quick to comment on what a lovely puppy Maizee is. I told her that we had bought Maizee from a very good breeder and my groomer replied, “You can tell.” She then pointed out that Maizee’s bright eyes, along with the whites of her inner ears, indicate that she has been very well bred. My groomer commented that well-bred dogs are a rarity these days. I was not at all surprised to hear my groomer’s comments about Cory and Terri-Anne’s breeding program. It was obvious to me when I first started communicating with Cory and Terri-Anne that they were very dedicated, caring and ethical people. I cannot say enough good things about them. Maizee has been a wonderful addition to our family and gets along great with our two-year-old pug, Tucker. It was also obvious from the start that Maizee loves kids, and our four-year-old daughter just adores her. Maizee was the best early Christmas present ever! breeders hoping to find the best out there. I could not be happier with Cory and Terri-Anne. They helped me make an informed decision and gave me peace of mind that I was adopting from breeding experts who truly love their dogs. Being able to email Cory with any question during the adoption process and now, 5 months later is very much appreciated. I can rely on his expertise and trust his advice and recommendations. As soon as Chance came home, it was obvious that he was a puppy full of love and character. Now at 7 months, he is a combination of energy, playfullness, and the innocent Terrier mischief. All underlined with unconditional love. Chance is a puppy with unbelievable social skills that everyone notices. As we walk through the neighbourhood and parks, people constantly stop us to ask questions about him. Fellow dog owners are often amazed at how happy he is and how well he interacts with dogs and humans. He loves to spend time outside and has enough energy to run for miles. His favourite toys are ropes, tennis balls, and squeeze toys. He greets us with energetic leaps as soon as we come home and it is a welcome like no other. He makes us feel so loved and after a long day at work, it is amazing to come home so such a loving puppy. 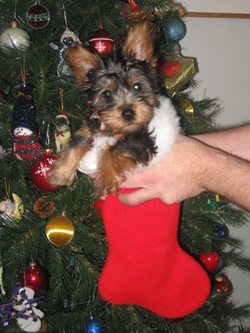 Silky Terrier to anyone looking for a puppy.